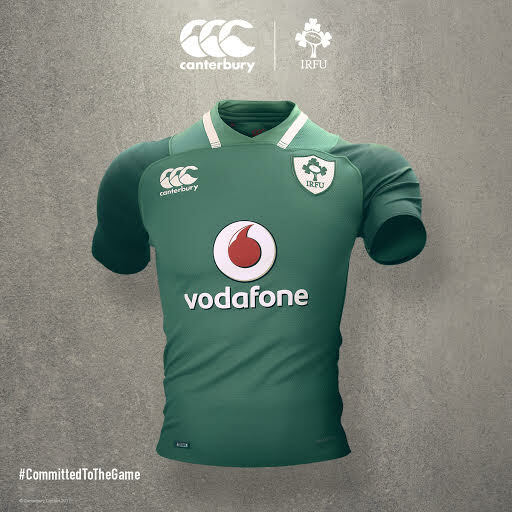 Canterbury, official kit supplier to the Ireland Rugby team, has today unveiled the new Ireland Rugby jersey for the 2017/18 season. The kit features ground-breaking technologies designed to give players an in-game competitive advantage, where the smallest of margins can separate success from failure. The iconic green jersey, reinvented with a modern twist, will be worn for the first time on November 11th when Ireland take on South Africa in the Guinness Series. As the game continues to adapt and evolve, Canterbury’s innovation team has redefined the function of a modern rugby jersey through research, testing and professional consultation, resulting in the most technically advanced jersey ever produced. Inspired by each of the four provinces’ highest peaks, the jersey’s insignia acts as visual distraction, designed to mask movement and allow players to slip through the tackle. Player comfort and tackle avoidance have been enhanced with the inclusion of flatlock seams, triple needle stitching, increased sleeve mobility and a double layered loop neckline. The jersey has also been tested to perform in the most demanding conditions with increased burst strength and durability allowing it withstand everything the modern game can throw at it. Supporters have the option of wearing the ‘Test’ jersey, a replica of the on field jersey, the ‘Pro’ jersey which retains the look of the jersey that will be worn by the team while offering a more comfortable fit, and the ‘Classic’, a cotton fabric with a relaxed fit. Each jersey has its own unique sequential numbered security authenticator giving you a truly one of a kind piece of kit. The launch of the new Ireland rugby jersey marks the start of Canterbury’s Rising Strength campaign which focuses on the premise that the Ireland Rugby team can only compete at the pinnacle of the sport if supported by a flourishing club and youth game. Canterbury’s 2017/18 campaign will focus on the link between club and country offering profile and reward throughout the year. The new Ireland Rugby range is now available to buy now from shop.irishrugby.ie and canterbury.com.